A vacation home worthy of your friends and family gathering. Unique home offers a large deck, dock and a beautiful view! 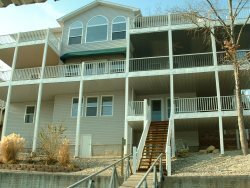 Lakefront 3 bedroom / 1.5 bath home on the 23 MM. Large open floor plan, vaulted ceilings, tiled floors, new quartz counter tops in kitchen, newly remodeled bathroom with a double vanity and a step-in shower. Walk out onto the gorgeous deck with a great fire-pit and beautiful lake views. With minimal steps to the water, you're on the amazing dock (No boat slip available) for you to enjoy swimming, fishing or basking in the sunshine. This deck also offers an 8x10 bar equipped with T.V. for entertaining. Located in one of the best no-wake coves on the Lake. Home also offers a gas grill on the lakeside deck.